Along with the 20 other features included with Configuration Manager Technical Preview 1802 is a report which extracts the relevant information from your clients in order to use them with Windows AutoPilot. 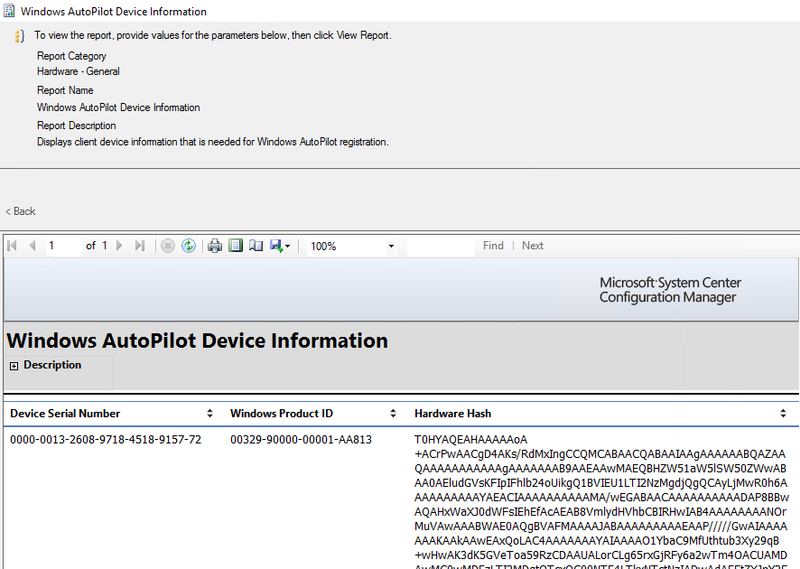 This collates the information from applicable Windows 10 machines (they must be 1703 or later) and the report can be found in the default reports under the Hardware – General section and is named “Windows AutoPilot Device Information”. Once you run the report you are not asked for any parameters at all, it simply lists your Windows 10 machines details. The nice feature of this is that you can use the export functionality of the reporting and export the information into a CSV which can be directly imported into Microsoft Store for Business or Intune (preview at this time) for use with Windows AutoPilot.